Named for their toughness and indestructability, Spartan series chairs will be standing for a long time. Serving as a contemporary, yet extremely durable seating solution for your restaurant, diner, or bar, the Lancaster Table & Seating Spartan series features a collection of comfortable, sophisticated chairs that will instantly upgrade the look and feel of any foodservice operation. 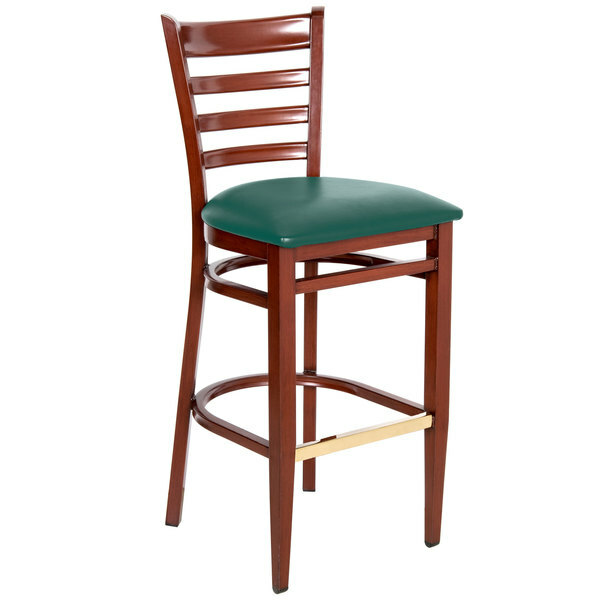 This bar height mahogany wood grain ladder back chair is fitted with a 2 1/2'' thick green vinyl seat for unparalleled comfort, while a unique metal frame boasts a classic wooden look. A ladder back design, in addition to reinforced joints, adds extra support to the chair's back, and a 500 lb. capacity ensures the unit will accommodate all your guests. The frame's finish is resistant to stains, scratches, and smudges, while a plastic glide is placed on the bottom of each leg to protect your floors from scuffing. Plus, the heel bar features a protective gold plate to guard against wear and tear. The Spartan series represents the last chair you'll ever need to buy, thanks to a nearly indestructible design that's guaranteed to withstand years of high volume use.